"Women Don't Ask does an amazing job in identifying and providing solutions to a very real issue: the challenges women face in negotiating. Linda Babcock and Sara Laschever have done a superb job not only in highlighting the problem of gender differences in negotiation but also in providing ways to begin fixing it. Example after example of the financial and emotional impacts make this issue extremely compelling. Any senior manager needs to be aware of the significant ramifications both in and out of the workplace. I highly recommend Women Don't Ask as a must read for executivesfemale and male." "This book is an eye opener, a call to arms, and a plan for action; it is enlightening, unsettling, and, ultimately, inspiring. Although women have made great strides in American society, the reality is that, since the 1990s, progress has slowed to almost a standstill. Gracefully and with humor, Linda Babcock and Sara Laschever tell a riveting story about an invisible problem that's been hiding in plain sight: one major reason that women still work for less money and advance less far and less fast than men is that women themselves have accepted the status quo and refrained from asking for more than they're offered and for less than they need or deserve. They make the noveland importantpoint that negotiation may be one of feminism's final frontiers. Of all the books about the roadblocks our society erects in women's paths, this one may prove to be the most useful in everyday life." "In this brilliant book Linda Babcock and Sara Laschever provide readers with the means not only of navigating the difficulties of negotiation, but also of fully engaging a modern world where traditional roles and norms are receding and business dealing has become more important. By looking at negotiation through the lens of gender, Babcock and Laschever explain why wemen and women alikedevelop our skills as negotiators, and in so doing they instruct us on how to become better negotiators. By illuminating negotiation through the reallife experiences of women and men, Babcock and Laschever underscore that most important lesson in all of negotiating: that the best deal is the deal that works best for all parties." "Women don't ask the important questions that will make them successfulbut Babcock and Laschever do. This is an important study of how women can become their own best advocates by knowing how to ask for exactly what they want in their public and private lives. The secret is in believing that one can negotiate almost anything. Venus and Mars, bosses and tyros: this is the book you need to bring peace and happiness to every relationship." "Raises important questions and sheds new light on a problem with which we will likely continue to grapple, in economies throughout the globe, for some time." analyzed and interesting book that is certain to be widely read, discussed and debated throughout the organizational world and is, therefore, a "must read" for both women and men. Highly recommended." "Women Don't Ask is not a straight recitation of factions?nor is it simply a "rant." It goes beyond well-know facts and offers concrete tips on how women can remedy underlying problems and actually move ahead. The authors prescribe refreshingly specific methods of negotiation that they've seen work fr even the most confrontationally challenged women." "This book is incredibly well-researched and thoughtfully laid out. It builds its case beautifully with interesting examples, then backs it up with empirical research. And credit to the authors' writing styles, for they do not point fingers or whine about the way things are.... The issues that the book explores impact women across all facets of their life-from negotiating child care responsibilities to getting the recognition and compensation they deserve on the job. This book has broad appeal to stay-at-home moms, women in corporate life and for the large contingent of female entrepreneurs. It is a must-have addition to all of our reading lists, and one that should bring positive results."  Kathy Elliott, co-author of "The Old Girls' Network"
"Provocative.... Women Don¹t Ask offers important insights into the persistent economic gap between men and women." exist for them. 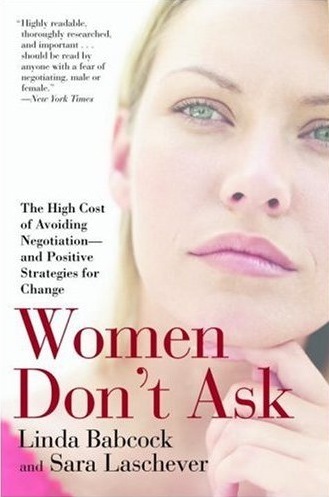 "Women Don't Ask" is extraordinarily relevant, on-point and well-written. Buy this book, read this book, share this book." "A compelling and fresh look at the gender-in-negotiation question that will fundamentally change how we think." "Women Don't Ask helps women learn how to communicate their desires. This is absolutely essential and basic information since we can't read brainwaves. Speak up or surrender your goals!" a great resource for anyone who doubts there is still a great disparity between the salary earnings of men and women in comparable professions." "The authors offer advice that is practical and likely to result in desired changes for women who want to be able to accomplish more in multiple spheres of their lives." "Neither a dry academic treatise nor a self-help book, this work puts forth a model for a society that respects women's communication strengths. " "Women Don't Ask is not a straight recitation of findings--nor is it simply a "rant." It goes beyond well-known facts and offers concrete tips on how women can remedy the underlying problems and actually move ahead. The authors prescribe refreshingly specific methods of negotiation that they've seen work for even the most confrontationally-challenged women."